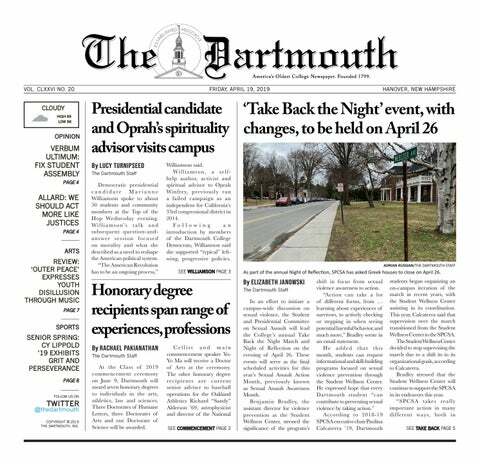 So you come into freshman year, and you think, “New Dartmouth, new me.” You stroll down the intersecting paths of the Green that are disorganized and rocky, unlike the future you have planned for yourself over the next four years. This past Saturday, I brought shame to my middle school self and disappointment to my high school beliefs. Choosing to attend a private college comes at a price, a price many choose to pay in the hopes of obtaining a higher return. Approximately three miles north of campus, a little deeper into the peaceful hills of the Upper Valley lies a farm “for the students” that offers an escape from the stress and demands that otherwise define the Dartmouth experience. This is the phrase and idea with which I came into contact multiple times during my conversations with some members of the Dartmouth Organic Farm. “It’s only three miles away, and you can go whenever you want,” Annika Bowman ’21 explained. This evening, contemporary jazz singer and songwriter Gregory Porter will bring his soulful, melodic style to audiences at the Hopkins Center for the Arts. Winter WhingDing is an annual a cappella show offered through the Hopkins Center of the Arts as a part of Winter Carnival programming. Students and local community members are invited to participate in a conversation about culture and adolescence at the Geordie Productions’ presentation of “Jabber” at Spaulding Auditorium in the Hopkins Center for the Arts on Sunday. The play offers the audience an opportunity to explore the perspective of Fatima, an Egyptian Muslim teenager who moves to a new high school.